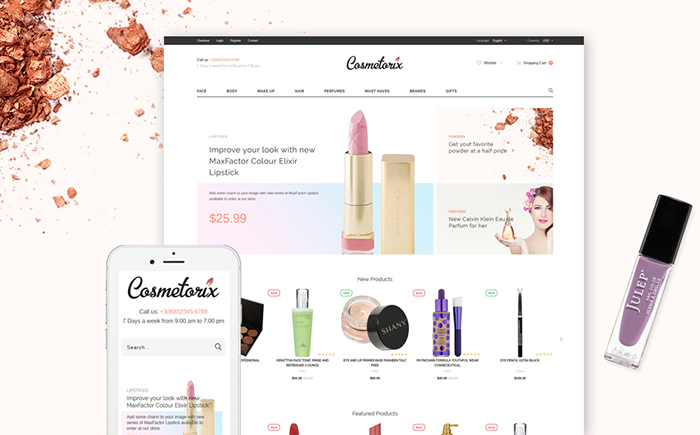 Our new compilation of the best OpenCart themes will be of use to everyone looking for a ready-made solution to get started with an eCommerce site, update the existing web resource or simply get a gulp of inspiration. The worldwide web technologies are constantly changing. We see a number of innovations being presented regularly. As a person working in eCommerce, you are likely to have a strong desire to integrate novelties into your own web projects. With the help of the below-listed newest OpenCrat templates, the task will get much easier. Packed full with multiple last-generation features, they allow even non-tech-savvy users to launch their own projects hassle-free. What makes the following themes worthy of your attention? Several of the below-listed designs are multipurpose. 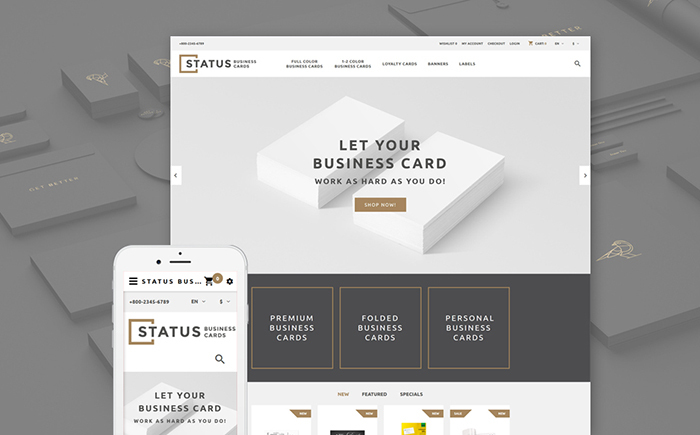 Pre-loaded with an array of ready-made pages suited for an array of eCommerce purposes, the themes are ready to go live out of the box. A variety of layout options, rich UI kits, working forms, and other elements speed up and enhance the themes’ customization to a great degree. All running on fully responsive frameworks, the themes are also SEO-friendly and crossbrowser compatible. Highly flexible and dynamic, they can be optimized for any purpose of yours on the fly. Designed and developed by TemplateMonster, all themes are well-documented and include free 24/7 support. The reliable themes provider has taken care of startups and launched a respective project, which reveals the main secrets of a successful online resource, as well as gives tips on how to run your online business properly. They have also released a series of free eBooks, which are available for unlimited download. Just in case you prefer step-by-step video instructions, then you can make use of the following playlist. Moreover, if you are limited in time and need pro assistance on installation and customization of the chosen template at an affordable cost, you can ask of TM Service Center for help. 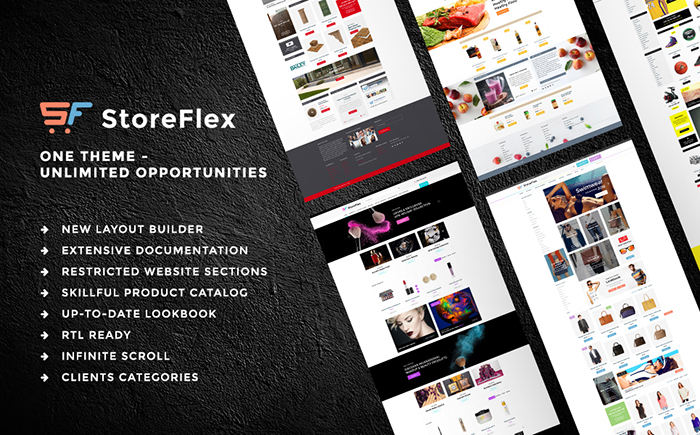 StoreFlex is a fit-it-all design suited for a number of eCommerce sites. This is an ever-growing template featuring a number of pre-designed skins, which will be expanded with more options with every next update. The availability of an intuitive layout builder allows you to craft versatile pages without touching a line of code. For a more effective showcase of your site’s items, you can make use of Lookbook Presentation feature. Navigation will get seamless thanks to the integration of Ajax search and smart product filtering. StoreFlex includes a number of smart options for site owners as well. For example, you can create categories of registered users and limit access to certain type of data for those people who are not registered on your site. 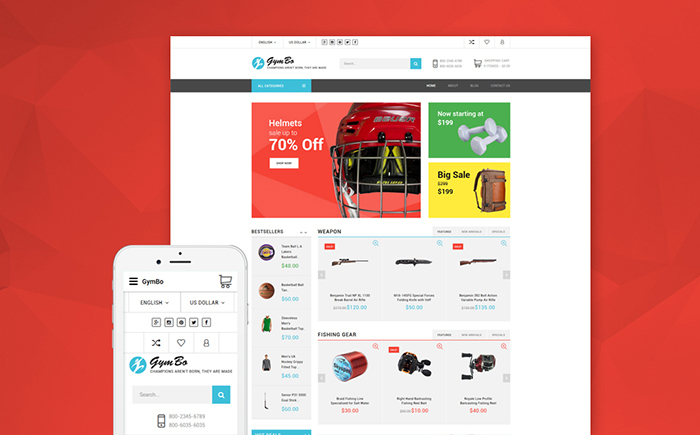 GymBo is a multipurpose eCommerce theme that comes pre-loaded with a number of pre-designed pages suited for dozens of product categories. Thus, downloading one template you attain a ready-made solution that matches fishing, travel, sports, accessories, bikes, and other kinds of web stores. 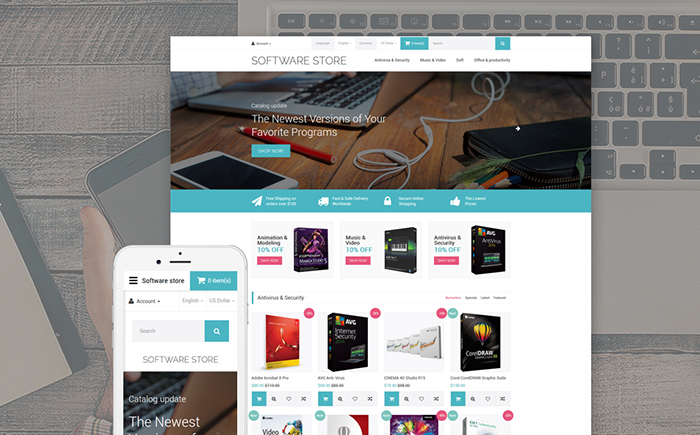 Owing to the clean and minimalist design of the template, the users’ eye will be drawn to your store’s products. With the purpose to save on space and help you showcase different types of items in a balanced way, the layout features grid-based content positioning. The latter will also provide for a flawless adaptation of your store’s content to smartphone and tablet screens. Promo banners with countdown functionality, product carousels, product badges, Ajax Search and Ajax cart, and many other elements are intended to provide online shoppers with a seamless shopping experience. The template is designed with usability in mind. The layout is spacious and quick to scan. The front page is dedicated to an effective showcase of featured items from the basic categories of the site. 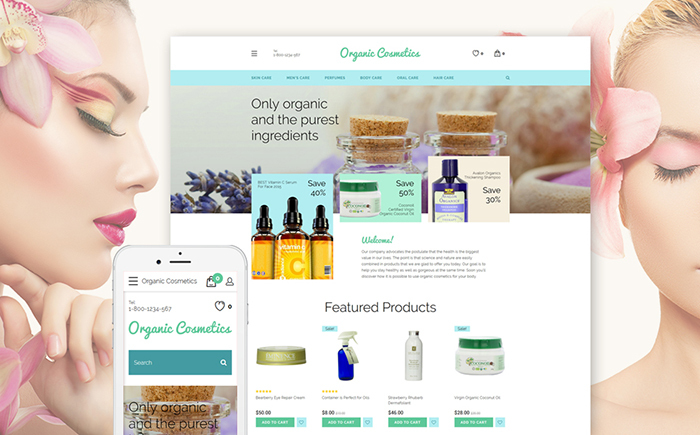 A grid-based content structure allows you to place multiple types of products in a well-balanced manner within one interface. The template is fully responsive. Multilanguage and multi-currency support will help you build a website targeting a wide audience. Ajax search enhances the site’s navigation. For the users’ convenience, the categories menu was organized in the left sidebar. Lookbook Presentation provides for an appealing display of your store’s offerings. 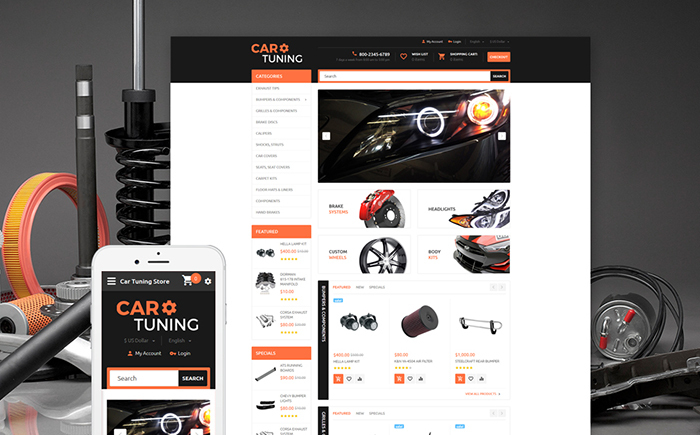 The template is best suited for car parts and accessories eCommerce sites. 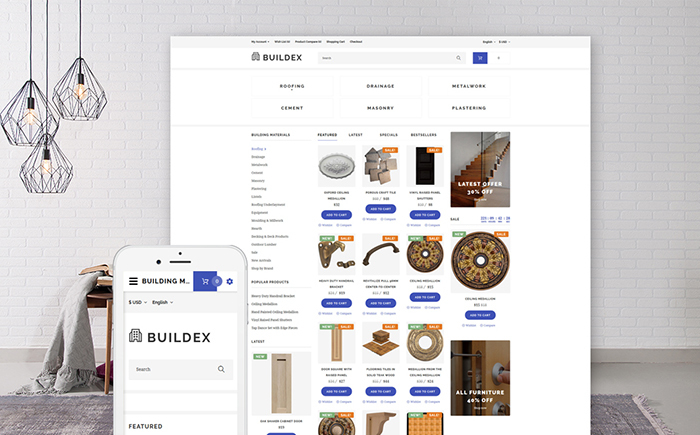 On the front page, different categories of featured products are visually separated from one another, providing for better scannability of the data. MegaMenu is organized vertically. Ajax-based search can be reached at the theme’s header. Quick View functionality welcomes the users to take a closer look at descriptions of the store’s items, add the preferred products to wishlist or straight to the shopping cart. 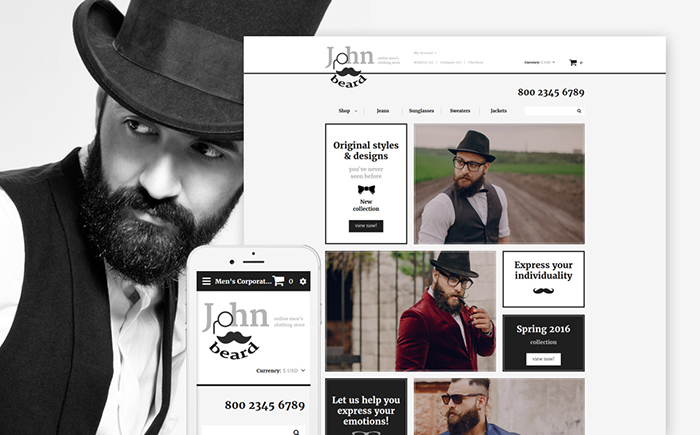 An elegant and stylish look of the template is best suited for presenting men’s fashion stores on the web. A classic black-and-white layout is quick and easy to scan. The template is touch-friendly. A functional MegaMenu remains fixed-to-the-top of the page as people browse your data. The theme is enhanced with cool animation effects. Hover effects and parallax scrolling backgrounds get the users immersed into the atmosphere of your eCommerce site. Background video support is intended to boost your site’s conversions. Beauty and fashion stores will look impressive when built with this theme. The layout is developed in a way that keeps the users focused on scanning through your content and keeping a close eye on the latest update. In addition to the fully-featured eCommerce functionality, the template features a built-in blog. In such a way, alongside with promoting your store’s items, you can keep the web community updated on your company’s or industry news. Quick View option, product badges, Ajax search, wishlist, add to compare, star ratings, and other smart options are included to enhance your site’s usability. Clear and concise layout of this template will be a perfect match for bringing a sleek and professional presentation to your eCommerce project. Although the design doesn’t feature any bright elements, it is focused on usability. The key navigation elements are recognizable and touch-friendly. Cool hover effects added to the product banners lure the users’ attention as they land on the store’s front page. The availability of a filterable products gallery lets your clients come across the necessary solutions with a click. Advanced search and sticky MegaMenu will only enhance the site’s navigation. Pure, light and airy design of the template makes it a perfect match for beauty stores. The template’s header features a sticky MegaMenu, providing the web users with quick access to the key product categories of your web store. Ajax-based search also remains in a fixed position. The theme’s backgrounds feature the parallax scrolling animation, which creates the illusion of 2D environment on the page. Catalog pages include both grid- and list-based view options. Thus, your clients can come up with the optimal solution for a more enjoyable browsing experience. 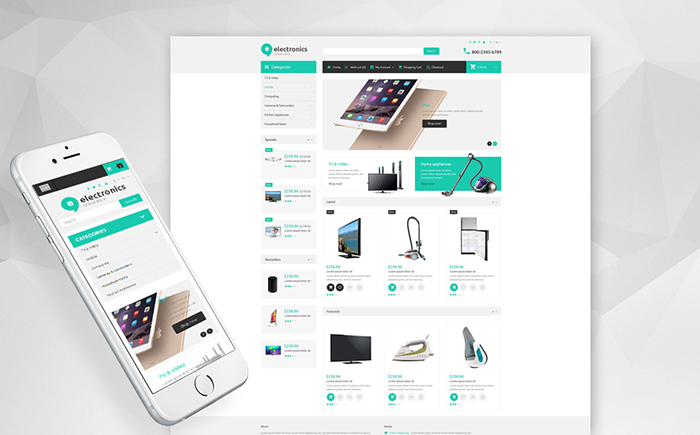 Pick this theme to sell electronic gadgets and devices on the web. Featuring a flexible and dynamic interface, the theme can be easily adjusted to match any web project of yours. A set of pre-designed pages, a collection of Google web fonts, and advanced customization options speed up the process of the theme’s modification to a great degree. It goes without saying that the template is fully responsive and crossbrowser compatible. By means of sliders, you can showcase your store’s products effectively. The availability of working forms makes it quicker to get started with a reliable and trustworthy presentation of your business. The template is intended for selling software to the highly demanding web community. Provided that most of the contemporary web users browse the web from their handheld devices, the theme is designed to be fully responsive. The layout looks clean and clear. Featured products are organized into filterable product galleries. The items are supplied with star ratings, product badges, wishlist, and add to compare functionality. Integrated with a blog and newsletter subscription form, the template can be also used to establish a long-lasting relationship with your audience. 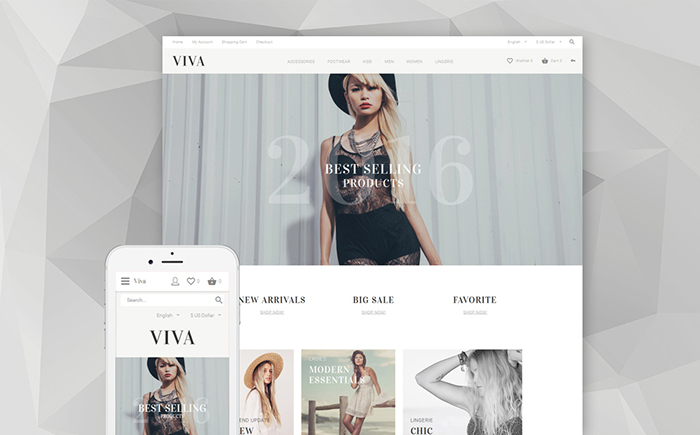 Make use of this responsive and retina ready template to bring a smart and casual look to your fashion or beauty store. The template features multilingual and multi-currency support. MegaMenu is sticky, providing the users with quick access to all categories of your store whenever they want. Quick View feature and detailed product page provide the users with explicit information about the preferred items. Integrated blog will keep the users updated on the latest news. 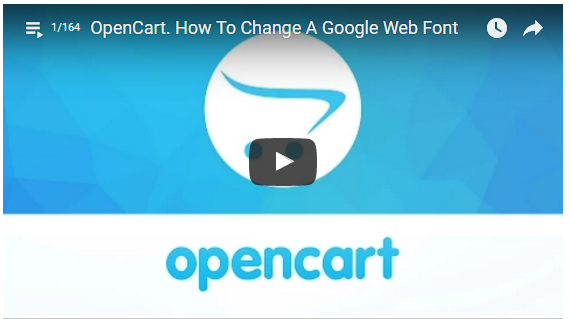 Have you found the best OpenCart template that matches your requirements? 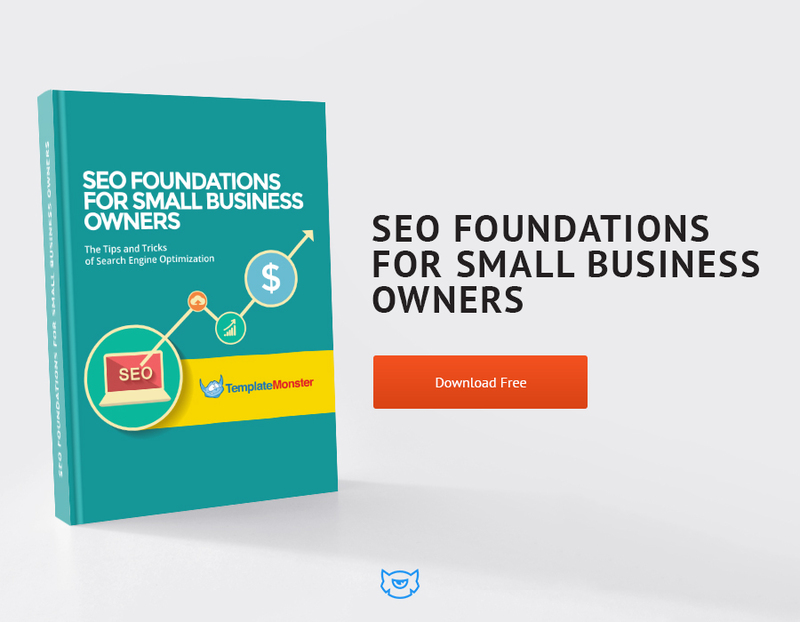 If you are ready to get started with your own eCommerce project, then the following free eBook with SEO fundamentals will help you get started with a well-optimized, high-ranking site.